How do you pronounce the word "Stratego?" Your setups are all wrong. My Stratego game has the Marshal with a numeral ranking of "1" not "10". In this old versions, (used for the first 37 years) the Marshal is the strongest piece and is numbered with a "1". The General is numbered with a "2", etc. Why did Hasbro change the numbering system? Your guess is as good as mine. The only thing I can think of is that Hasbro must have thought the intelligence of today's "kids" couldn't handle understanding the fact that a "lower" number means a "higher" rank... so they reversed it. That, the cheap, see-through plastic, and the decals make the new version worthless to me. What are the rules for the Spy? Can any piece kill them including a Scout? Can a Spy kill any piece? If ANY officer ever attacks the Spy, the Spy is defeated. If the Spy attacks ANY officer (except the Marshal) the Spy is defeated. The only time the Spy EVER wins a battle is if the Spy attacks the Marshal. If this happens the Spy is the winner and the Marshal dies. Still not clear? Okay, I'll rephrase it. The Spy is the lowest ranking piece. Every time an enemy officer strikes it, the Spy dies. Every time the Spy strikes an enemy officer, the Spy dies... unless this officer is the Marshal. If this happens, the Spy wins. And yes, if one Spy attacks another Spy, both die. Note: The Spy can capture the enemy Flag. 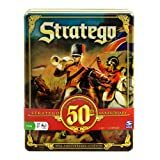 Do you know where I can download a good computer Stratego game. I'm only aware of two commercial Stratego games - the 1990 Accolade Stratego program and the 1999 Stratego program by Hasbro. Both of these play a terrible game of Stratego - the artificial intelligence is very poor. I'm not aware of any other Stratego programs, of any kind, although I'm sure several freeware and shareware programs must be out there. A search at some of the better shareware sites should turn up something. 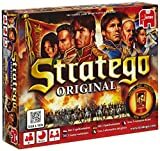 I recall seeing a few Stratego clones several years ago. They had very poor graphics, few options, and a weak AI. 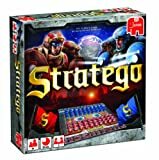 I'm looking for a site where I can play Stratego against others? Do you know of any? For awhile you could play online at the MSN Gaming Zone, assuming you had a copy of the 1999 Stratego PC game, by Hasbro. However, I understand at this time MSN is no longer supporting Stratego at their gaming site. But a better advice is to go to www.stratego.com. Here you can play the official game hosted by Jumbo. This is the place-to-be. There are also versions for iPad and Facebook. The only other places to play online that I know of, are listed in the LINKS section, near the top of the page. But they are not so good like the official version. I have a Stratego game but I've lost one piece. Do you know where I can purchase a replacement piece? No, but I have a suggestion... simply purchase another full set on eBay. Usually eBay has DOZENS of Stratego sets for sale, in good condition, often for just a few dollars. I've read the Scout "can move and strike in the same turn," but I've also read the Scout "cannot move and strike in the same turn." Which is correct? "The Scout may not move & strike in the same turn." However, other sets do not include this sentence at all, which (to me) infers it is possible for the Scout to "strike from afar." Before playing a game, it would be wise to agree on which rule you wish to use. Have you heard of this trick/tip? When it's your turn, place your hand on a bomb as if you were going to move it. Hesitate for just a moment, pretend to be thinking about the move, and then pull your hand away and move another piece. (You don't actually move the bomb). Your opponent should think... "That piece isn't a bomb... he was thinking of moving it... when, of course, it is. KABOOM! Yes, dozens and dozens and dozens of people have told me about that "trick." The truth is, only very weak players fall for it and strong players don't need to use such tricks.